Our children themed towel collection set is cute, colorful and will be sure to bring alive the imagination of our little ones! Our towel sets are bright, colorful, and all beautifully embroidered. They are naturally super soft and absorbent, no chemicals were added to the production to enhance these textures. These are pure natural cotton towels, safe and durable for the entire family! 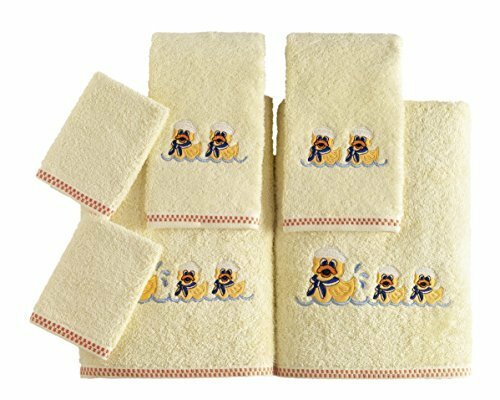 Our Children Themed Towel sets includes: Two (2) bath towels, two (2) hand towels, two (2) washcloths. Type of cotton: Turkish cotton. Materials: 100-percent premier Turkish combed cotton. Care instructions: Turkish cotton is the best washed in warm water using half amount of a gentle detergent recommended. Bleach will make the white towels harder hand feel. Fabric softener will actually decrease the absorbency of the towel. PLUSH, SOFT AND ABSORBENT: Our towels are manufactured using only the highest quality Turkish cotton. Using combed cotton, our towels will feel super soft and plush against the skin and because it is rated at a density of 550 GSM, you can rest assure our towels will also perform above expectations. CUTE THEME AND COLORS: Our beautifully designed children and baby towels and bright optical colors help bring any room or imagination to life! NATURAL HIGH QUALITY COTTON: Our products are manufactured in Turkey, meaning we source only the best possible cotton that is naturally grown in that region. Because of ideal growing conditions, Turkish cotton is highly touted as a premium, luxury cotton used in many 5 star hotels and high end spas. GREAT GIFT OR ADDITION TO A REGISTRY: Our super soft children and baby towels are an excellent addition to any registry or can be given as an ideal long lasting baby gift that can be reused and rewashed several times. SAFE AND FREE OF CHEMICALS: We use mills only that meet a rigid and strict Oeko-Tex Standard 100 certification. This certification prohibits the use of any harmful chemicals within the manufacturing process. Know that you can purchase our cotton products with peace of mind. If you have any questions about this product by SALBAKOS, contact us by completing and submitting the form below. If you are looking for a specif part number, please include it with your message.